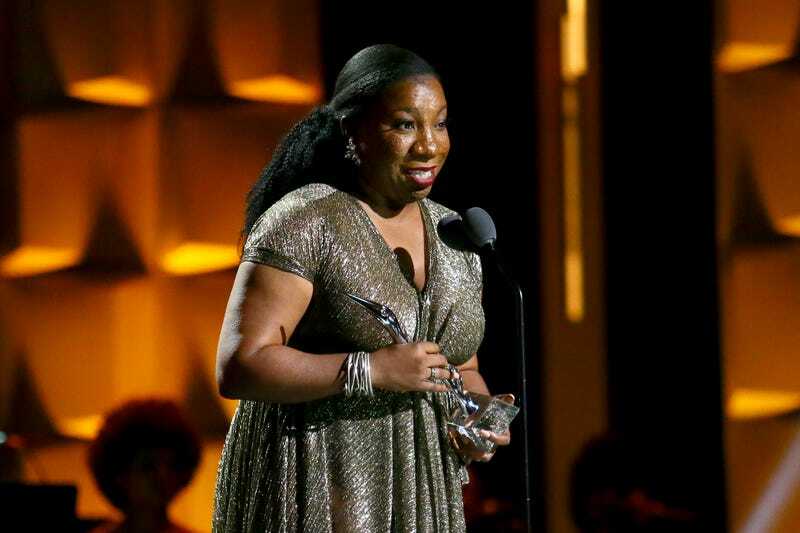 Tarana Burke speaks onstage during the Black Girls Rock! 2018 Show at NJPAC on August 26, 2018 in Newark, New Jersey. If you’re active on social media, you may have been greeted with a very important anniversary this morning: the one-year anniversary of the #MeToo movement. Yay! And if you’re anything like this writer, seeing tweets like this one by an otherwise credible news source, the Daily Beast, pissed you the entire hell off. The reasons for my anger are aplenty: For one, it enrages me that we can only mark one year in our calendars since predators have begun being held accountable en masse for their abuse—and that a year later, alleged predators are still being elevated to the highest offices in the world. But mostly, on this particular day, a year after long-rumored allegations against Harvey Weinstein finally gained traction due to multiple exposés by the New York Times—a revelation immediately followed by famous white women embracing and employing the hashtag now known around the world—what really pisses me off is the continued erasure of its actual originator, Tarana Burke. Burke very deliberately created not only the hashtag, but the accompanying movement in 2006. While it may not have gained worldwide attention at the time, it was nevertheless a beacon for those who knew about and desperately needed it. And those of us in the know gathered in a collective and effective outcry in October of 2017, when we saw the hashtag being used without crediting the woman who originated it. So, it’s deeply disheartening to see the movement inaccurately described as only being one year old today, based solely on the date the mainstream media became aware of it. Full disclosure: Burke is a longtime acquaintance turned good friend in the past year—notably, after The Glow Up and many other outlets began to cover her. As she disclosed to us not long after #MeToo went viral, and to the world when she was honored at this year’s Black Girls Rock! ceremony, this movement actually began in service of us. By “us,” I mean the black and brown women and girls who are disproportionately affected by sexual abuse, specifically because we are less acknowledged, traditionally more highly sexualized, less believed when we report, and ultimately, less valued by the world at large. That’s right: We’re happy to share, and even build with you. But what we’re not going to do is act as if this movement was put in motion solely by the Harvey Weinstein reporters, Rose McGowan and Alyssa Milano—the latter of whom gladly gave credit where it’s actually due. But if this feels particularly insulting, it’s because it’s the same dynamic that affects women of color worldwide. For many of us, the movement has been building for well over a decade, but we are all too used to our issues being ignored until they affect white women—if they are acknowledged at all. Instead, we must wait for our traumas, our priorities, hell, even our beauty, to become mainstream before it merits mention. And even then, they still might not mention us. The Root will be giving Tarana Burke her due during this year’s The Root 100 ceremony after she topped our list of influencers this past year—not because that’s when she created #MeToo, but because of how she continues to leverage its newfound popularity for the benefit of all victims of sexual predation. And while the more myopic of the media may capitalize on today as a moment to sensationalize a 12-year-old movement as a trending topic, we’ll console ourselves with Burke’s words at Black Girls Rock!